Buyers of the Mitsubishi Xpander: the wait is almost over. Mitsubishi says that first batch of the Xpander MPV has finally shipped from its state-of-the-art assembly plant in Bekasi, Indonesia and is heading to the Philippines. Indonesian President Joko Widodo joined Mitsubishi Motors Chief Executive Osamu Masuko for the ceremony commemorating the export launch of the Xpander last April 25. The milestone comes after a year since the inauguration of the carmaker’s manufacturing plant. 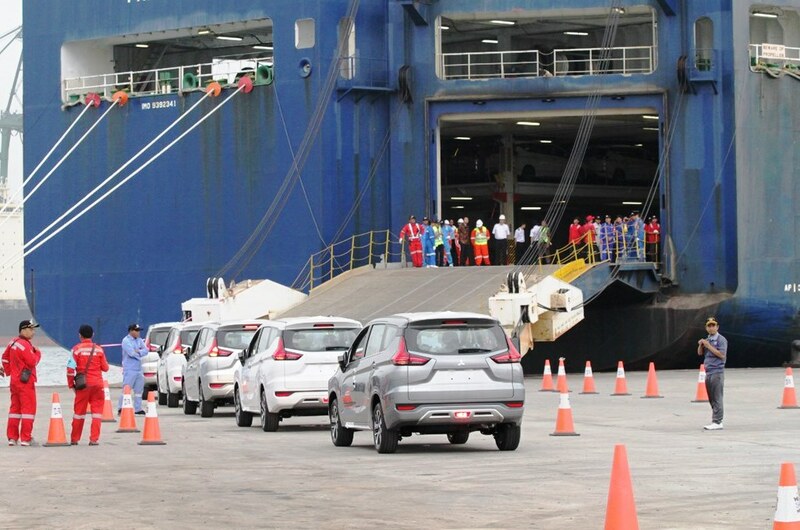 This marks the first time Mitsubishi will export vehicles on a mass scale from Indonesia. “I am delighted that our company can contribute to the growth of Indonesia, which has been so supportive since we first arrived almost 50 years ago. The export of Xpander is an important milestone in our ongoing business plan, and adds further to our strong foundations in ASEAN, which are key drivers of our growth in the region,” said Mr. Masuko. Currently, the Xpander has been enjoying brisk sales in Indonesia with over 66,000 orders to date. It has become the Japanese carmaker’s best-selling vehicle there. The Philippines, which is the first market to get the Xpander outside of Indonesia, has seen more than 2,000 reservations for their 7-seater MPV. If everything goes to plan, the first batch of Xpander MPVs should arrive at Philippine ports as early as next week. This means that customers who placed reservations should be able to drive their new Xpander off the showroom by the last week of May. sayang tayo, these should have been "made in the philippines" since we are gateway to asia and human resource is highly skilled...anyare satin? Kung may business ka dito sa Pilipinas, malalaman mo kung gaano kahirap mag put up at mag maintain nito. Red tape everywhere. Oligarchy. Pilipinas ang may pinakamataas na electricity rates sa buong South East Asia at isa sa pinakamataas sa buong Asia. Pilipinas ay isa din sa may pinaka mahal na internet rates sa buong mundo pero napakabagal naman, ang masakit pa dun magnanakaw pa ng credits ang mga Telecom companies. Ayaw na ayaw yan ng mga foreign investors, kaya kulelat talaga tayo. Tama. Ta's ang retarded pa ng gobyerno. Magtatayo ka ng negosyo, ang daming dapat kausapin. Ang daming dapat gawin. Ang daming dapat bayaran. Tignan mo na lang Philhealth / SSS / Pag Ibig. Pahirapan kausap. Ayaw na lang pag isahin. Kaya sooner or later mauunahan tayo ng Viet nam. Sabaw talaga. Wag rin kalimutan mga welgista. Laging api. Hindi ma realize na ang negosyo ay para kumita, hindi charity. Kaya yung mga kumpanya, nagsasara. Yes totoo yan pati yung mga NPA. It'll take a lot of reforms and sacrifices bago tayo maging manufacturing hub ng carmakers or other industries, although madami naman factories sa Laguna Technopark and sa Batangas. kelan na ba magsusuntukan mga xpander vs rush fanbois? Yeah. I’m willing to pay for that. Yung tittle fight dapat Mazda vs Honda. Mazda vs honda? that should happen soon! they might even argue against each other regarding the specs and features of the TICKET for the fight!! The Expander is just a blown up piece of front grille art. The wheels are tiny like in a matchbox toy. The Rush has more of a balanced style.